Shot Blasting - An Important Tool | Blackwell's Inc. The concept of "shot blasting" has now expanded and in today's world, is usually called "media blasting" because it uses different types of "shot" or "media" to do different types of jobs. Media blasting is an important tool for us in our industrial coating work. is the attached dust collector. Media blasting machines forcibly propel an abrasive material (the blasting media) at a very high velocity, in a controlled pattern and direction against a surface. 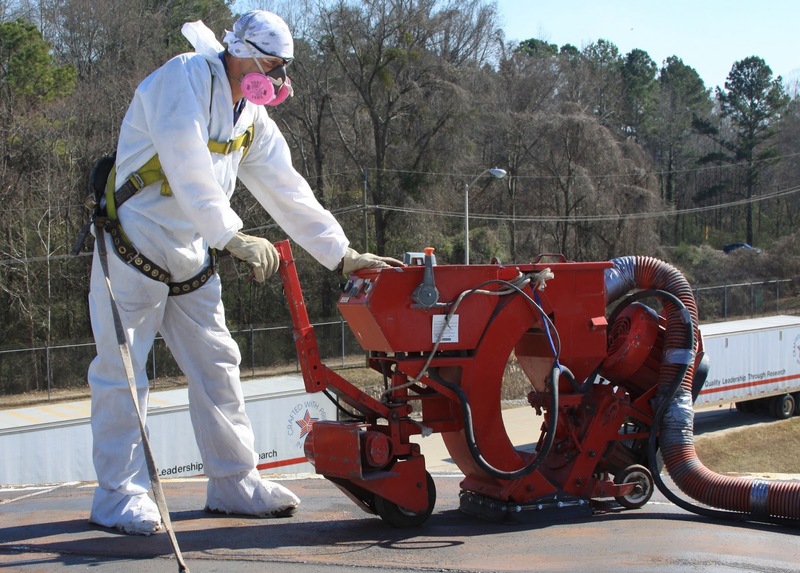 When the blasting media strikes the surface, it creates a pock-mark surface that helps create the proper surface desired. By varying the blasting media, such as changing the size, shape, type or velocity, shot blasting can be used to either smooth a rough surface OR to roughen a smooth surface. Used on steel surfaces, shot blasting removes rust, old paint, coatings, and can smooth or roughen the surface as needed. By roughening a surface, say a concrete floor, shot blasting gives the concrete more bonding surface for coatings or overlays. At the same time, it can be used to remove dirt, oil, old coatings, and old marking stripes. As the blasting media strikes the surface, it rebounds, and along with the removed surface contaminants, is collected and separated into a recovery chamber. The usable blasting media is returned to a storage hopper and recycled to be used again. The pulverized blasting media, dust, and contaminant is collected by a dust collector. Because the usable blasting media is recycled, very little abrasive material is lost. 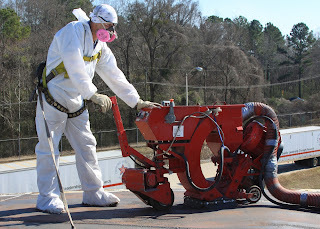 For surface preparation work for new coatings, shot blasting is an indispensable tool for us.